We’ve taken refuge from the rain in what for many, and for many centuries, has been a place of pilgrimage. For us though it’s our starting point. After an hour or so marvelling at the architecture of St David’s Cathedral – why does the floor slope upwards towards the altar? We both decide the nearby Grub Kitchen Café – the first edible insect restaurant in Britain – isn’t quite our cup of tea. “Thanks but we’re fine. Honestly we’re not hungry”… and set off. Our mission is simple. We’re going to drive what’s known as The Coastal Way, the entire length of Wales’ Welsh coastline – from the UK’s smallest city in the South, to the pretty little former fishing village of Aberdaron in the North. Or at least as much of it as possible, time and the odd diversion allowing. Our reason? Because we could. We thought it might be more memorable too if we could borrow a Grand Tourer. So, we gave McLaren a call. Fortunately they had a 570GT (GT: Grand Tourer, get it?) they didn’t mind us putting a few hundred miles on. With last week’s sunshine now long-gone, rain and a thick sea-mist became our constant companions for the next couple of hours at least. Typical! The radio forecast says next weekend’s set to be a scorcher too. Oh well…I switch on the wipers, Rebecca cranks-up the air-con. We press on. Nearby Whitesands Bay will have to wait for another day. I’d expected to see more trucks bound for Ireland on the way up to Fishguard but instead it’s cyclists (something that we’ll encounter again) that we see most of. Rather them than me. The climbs here are steep, the descents steeper still, and even we are hard on the brakes in places. But at least the weather’s beginning to ease enough for us to take a few snaps of the sea before we move inland for a little while. We make good progress as the road widens and we cross from Pembrokeshire into Ceredigion, crossing the Teifi at Cardigan as we go. With a lunch-stop planned, we pause to let the caravans make the turn for New Quay at Synod Inn before weaving our way downhill once more, and then parking by the sea wall in the small but perfectly formed Regency town that is Aberaeron. Sadly our budget for today doesn’t allow a visit to the Harbourmaster, the bright purple hotel on the harbour-front made famous by Rhod Gilbert in the Visit Wales adverts, so we chomp cheese-burgers and honey ice-cream at The Hive Café instead. Fed, watered, and blown by a wind so strong it’s hard to stand-up in we make our way into the Hinterland. Viewers of S4C’s and BBC4’s film noir style Y Gwyll (the Dusk) aka Hinterland will recognise Aberystwyth’s prom almost immediately. 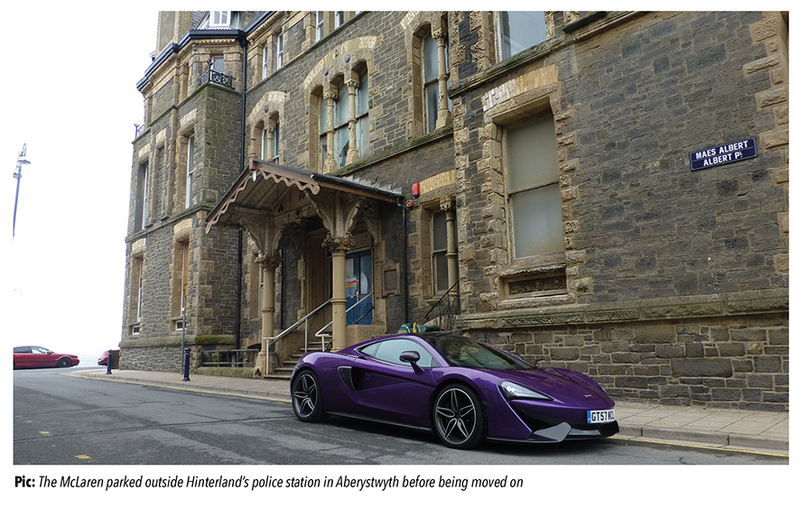 The former Ceredigion Council offices that sit on the corner of Albert Place were used for the external shots of the show’s police station, and the Hafod Hotel in Devil’s Bridge, another of the dark drama’s key locations is all but a short steam train ride away. I’ll admit Aber’s faded Victoriana has always been somewhat lost on me, nevertheless it’s busy on the prom when we arrive in the early afternoon. 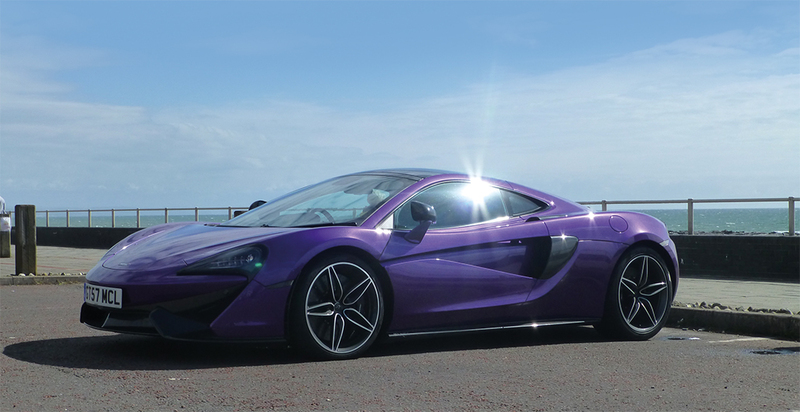 I want a shot of the McLaren outside of what was DCI Mathias’s front door, so I thread a bright purple supercar through the Saturday shoppers and pull-up right outside. It’s only after we jump out that Rebecca and I realise the 570GT is actually this afternoon’s star attraction. Camera-phones appear from every corner and a small crowd begins to gather. Luckily everyone gets a picture before a passing WPC moves us all on. Oh, the irony! Once out of town the A487 stops hugging the coastline and moves inland. As a result the landscape changes. It’s lusher, there are more trees. It’s an indication of what’s to come. We cross the Dovey at Machynlleth and turn left, into Snowdonia. 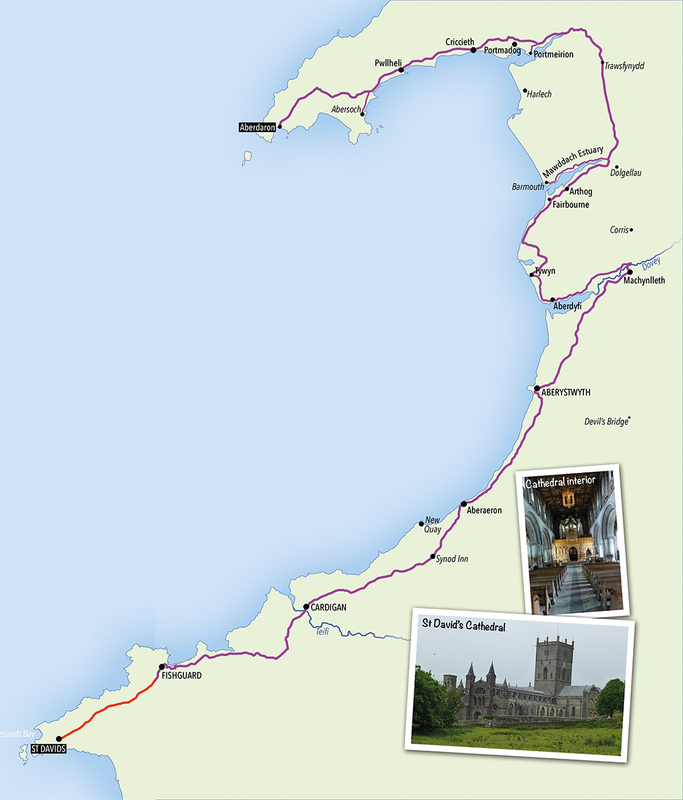 The direct route north from Aberystwyth would’ve taken us through Corris and up to Dollgellau, but it’s our mission to stick to the coast. Aberdyfi offers us more crowds and camera-phones, Tywyn gives us ice cream, yet more strong winds and virtually the whole seafront to ourselves, and Fairbourne, that’s a nice surprise – we’ll come back again soon. After them comes Arthog, our rest-stop for the night. It’s almost too easy to miss the turning for The Slate Shed at Graig Wen but we’re so glad we don’t. This place is a real find (Thanks Rebecca!). Built in 1868 with thick stone walls and massive timber beams, it was originally used by quarrymen who split rock into Wales’ famous roof slates. Now beautifully refurbished with a mix of custom made furniture, mid-century design classics, traditional Welsh materials and contemporary en-suite facilities it’s the perfect place to unwind after a long day’s drive with a well-earned mug of Welsh tea and slice of Bara Brith or two. But that’s just the half of it: It’s the views this place offers over the Mawddach Estuary and the surrounding mountains that really steal the show. Honestly, stunning doesn’t do them justice. We sleep like logs and after refuelling ourselves with owner Sarah’s pancakes, salmon and scrambled eggs, and high-octane coffee, we desperately need to refuel the 570GT. Filling-stations in this part of Gwynedd are few-and-far-between. So, as we ate in Barmouth last night at the tiny Bistro Bermo (another brilliant discovery), we might, just might, get a view of Harlech Castle from where we’re headed, and because Stage 5 of the Women’s Tour cycle race starts in Dolgellau this morning before going through Dyffryn Ardudwy, we head straight – literally, look at the A470 on a map – to Trawsfynydd and top up the McLaren’s tanks opposite the lake. Seventy-two quid’s worth of super-unleaded later and we’re on our way again. Destination Aberdaron. It’s straight-on again for us at the roundabout near Portmeirion (Be seeing you, I’m not a number! I am a free man! etc. etc. ), straight across Britannia Terrace, where we run alongside puffing narrow-gauge steam trains, up Porthmadog High Street, and then left on to the A497. It looks like the weather’s taken a turn too. By the time we reach Criccieth we can almost smell the sea before we see it, and as we pass the Lifeboat Station the surf and white-wash breaking on the beach makes us appreciate the work of the local volunteers all-the-more. We’re all-but drenched trying to photograph the castle; our plan to have both Harlech and Criccieth in the same picture foiled by Mother Nature. Undeterred, but perhaps a little damp, we switch on the wipers and turn up the heating once more and head ever further on to The Llyn Peninsula. The A-Roads run out at Pwllheli and after a brief and nostalgic diversion to Abersoch (I used to come here as a teenager) we wind our way down into Aberdaron. As we pull into the car park, the National Trust ranger pulls out his phone in order to take a picture of the car, before following us to our parking space and taking a photo of himself with the car, and then, after asking us politely in both Welsh and English, another of himself in the car. And he’s not the only one. McLarens are few and far between in these parts no-doubt, we probably stick out like a sore thumb. Our purple projectile is getting likes on Instagram before we’ve even stopped its engine – Aberdaron, surprisingly, is a superfast wi-fi hub, the whole village has it. This tiny village is for us journey’s end, and on a wet and windy day it feels like we’ve driven to the ends of the Earth. But God has it been worth it! Like the rest of the pilgrims gathered here this Sunday we take refuge from the rain, only this time we’re in the bakery. Bistro Bermo and Coes Faen. The A470 to Trawsfynydd – always a favourite. The welcome we received wherever and whenever we stopped. 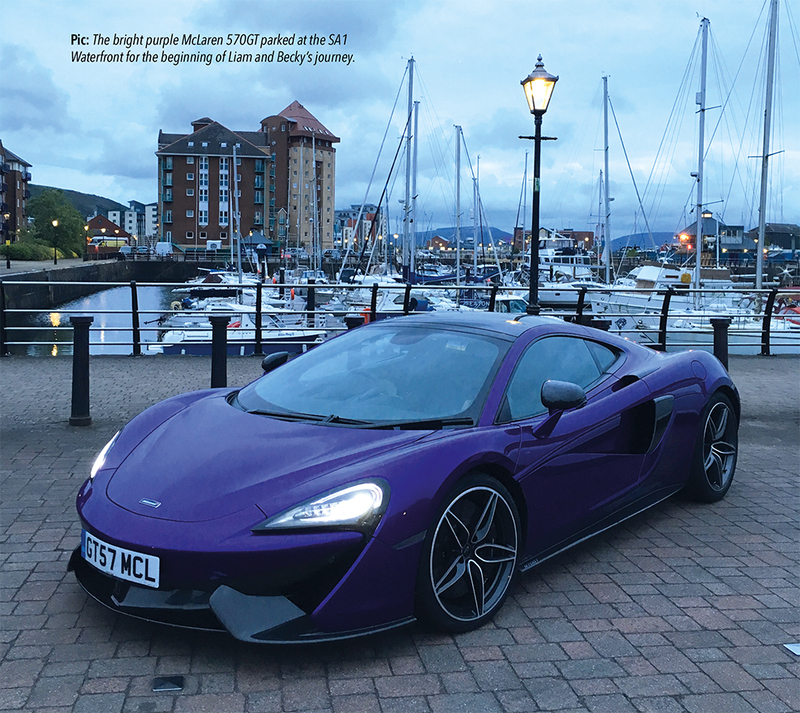 So, why a McLaren 570GT? As the most refined member of McLaren’s Super Sport Series the 3.8 litre twin-turbo V8 570GT is McLaren’s most use-able car to date. It’s smaller than you might think but packs more luggage space than a VW Golf, thanks partly to a hinged, glass, rear hatch which opens grand piano style, towards the kerb. It’s also the first McLaren to feature things like a glovebox, and door pockets, for your bottled water, sunglasses, and sundries. Swing open one of its dihedral opening doors and once aboard your greeted by a cabin that eschews the usual McLaren carbon-fibre trim and instead replaces it with thick and subtle soft leathers. 8-way adjustable seats and a powered steering column that make for a superb driving position. An (optional) panoramic roof makes things feel light and airy, as does the deep wind-screen. It’s also surprisingly quiet, there’s a quieter exhaust system and specially developed Pirelli P Zero tyres, which incorporate their own internal noise cancelling system. It’s quick: 0-62mph takes just 3.4 seconds; 0-124 just 9.8. And yet on a good road and when driven sensibly it will deliver 26.6 mpg. 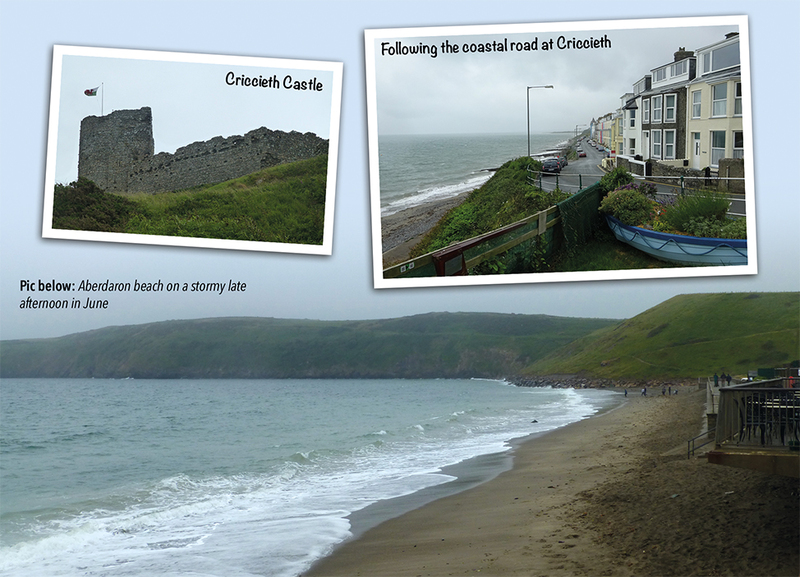 First we had to get to St David’s, and after we’d driven the 178 miles to Aberdaron we had to get home again. Our round trip distance was…in total…a Grand Tour…of 570 Miles. Thanks also to Sarah, and everyone at The Slate Shed.